Last week, Roger had the unique opportunity to get a single copy of the Sigma 24-35mm f/2 Art Series to test the sharpness up against the most common lenses in the 24mm and 35mm focal range. When Roger was done with his tests, and showing off his results, I had the opportunity to bring the lens home with me and give it some real life testing this weekend. Admittingly, I was a bit perplexed by this lens when it was first announced. Certainly the Art series lenses from Sigma have impressed and surprised the entire industry these last couple years, with their incredible sharpness and equally impressive price points. So when Sigma announced a new lens, everyone was suspecting a refresh to their popular 24-70mm lens, which is why the 24-35mm had so many left a little disappointed. However, at f/2, this is the fastest zoom lens ever made for full frame sensors, and the early test on sharpness regained some interest from many. Before I get too involved in this review, I’d like to start by stating I miss my 35mm f/1.4 lens, and this lens just fueled that feeling of discontent even further. A year or so ago, I agreed to trade my Canon 35mm f/1.4L for a 24mm f/1.4L II straight up with a friend. Financially, the deal was sided to me, so I had nothing to lose. Since then, however, my love and appreciation for the 35mm f/1.4 has only grown, and I just haven’t gone ahead to sell my 24mm f/1.4 for a new 35mm just yet. The Sigma 24-35mm f/2, if nothing else, has convinced me to swap out my 24mm for a 35mm. Like all Sigma Art series lenses, the build quality is unsurpassed, and the attention to detail is incredible. Pairing that with the sharpness that comes with the Art series, Sigma has done it again with creating an incredible lens with an impressive price (and a pretty lens to boot). The only thing that really had me questioning the lens is the focal length, at 24-35mm. I get it, the 24-35mm lens is designed to give people a two for one deal, and sacrificing only a stop in comparison to the premium versions of the 24mm and 35mms – and at an even cheaper price. That said, when I’m using a zoom lens, I’m expecting some severe changes from one zoom end to the other. 24mm and 35mm offer very limited differences in focal length, which is the big suffering point for the lens. It honestly felt more like a simple prime lens for me, and I often had it set to 35mm and left there. While the zoom might be important to some, I just can’t find the purpose of having a zoom only cover 11mms. The other suffering points come from the very nature of a zoom lenses as well. At nearly 950g, the Sigma 24-35mm f/2 Art is considerably bigger and bulkier than most 24mm and 35mm lenses, and nearly 40% heavier. And that bulk comes with a slower autofocus as well. Albeit, not nearly as slow as the Canon 85mm f/1.2L, the Sigma 24-35mm is obviously slower than its prime competitors, which could be an important element for some photographers. All that said, these were shortfalls I could see before even using the lens. When I was able to use it this past weekend, I found that it felt really great in my hands. While the focusing wasn’t lightning fast, it was still able to capture moving subjects with ease and accuracy. The sharpness is great, and the distortion is minimal (given the focal range of the lens, at least). When shooting backlit and into the sun, I was still able to get plenty of accurate focus, with little to no flaring, a problem I often had with my Canon 35mm f/1.4L. Perhaps what made me most excited with this lens comes in the super techy findings that Roger had during his lens testings. The Sigma 24-35mm has a large amount of astigmatism. To simplify that, the Sigma 24-35mm is more prone to what is commonly called “Swirly Bokeh”. Swirly bokeh is just as it seems, causing the bokeh to display itself with a slight rotation. I’m hoping to cover the topic of swirly bokeh more on a later article, with an explanation, more examples, and a list of the lenses most prone to the phenomenon. However, with the astigmatism of the 24-35mm, I did find a slight rotation within the bokeh when shooting with a shallow depth of field. Sadly though, at such a short focal length, the bokeh capabilities of this lens is limited, even when shooting wide open. The Sigma 24-35mm f/2 Art Series is an incredible lens, with incredible sharpness and the fastest f-stop available in a full frame zoom lens. That said, I was left still scratching my head as to why. To my knowledge, I don’t see a purpose for owning both a 24mm and 35mm, so this lens fixes a problem that many people don’t have. While the functionality of the lens is great, I can’t imagine people who already own a 35mm or 24mm interested in what this lens has to offer. 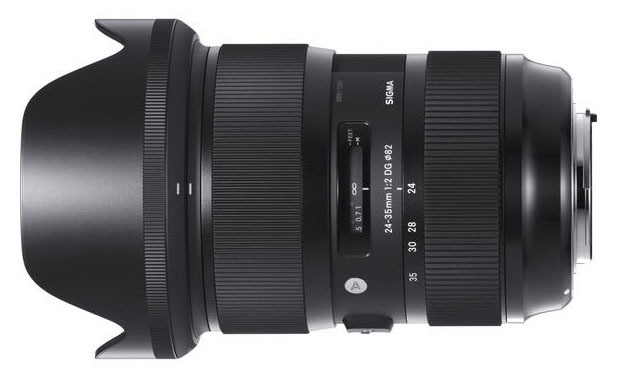 But if you’re looking for a discounted price yet capable wide angle lens, and versatility beyond a 24mm or 35mm, the Sigma 24-35mm might be the lens for you. If you’re looking for even more diversity beyond the wide angle focal ranges, the 24-70mm is still the king of zooms in my opinion and the better buy. For a more techy look into the Sigma 24-35mm Art Series, be sure to check out Roger’s post from last week. For someone who bought a new camera with a 24-105mm f4 image stabilized lens, who wants a wide-angle lens with a wider aperture and might already have a 50mm f1.4 and maybe a wide aperture 85mm lens for portraits, this zoom covers both 24mm and 35mm, which they just might see as a wonderful thing. Considering it covers 28mm too, this lens really is a three-in-one solution to the problem of not having a good quality, wide-aperture, wide-angle lens. Some, who have a 16-35mm f2.8 L from Canon, might see the wider aperture and better image quality as the main reason to get this lens, if they have recently bought the 11-24mm f4 L. It would make a great second lens to go with the 11-24 in replacing the 16-24 range with a greater range in a two lens wide-angle kit. For reportage, some photographers may find the f2 aperture and 24-35mm range of the Sigma Art lens preferable to the 16-35mm f2.8 L from Canon or the 17-35mm f2.8 G from Nikon. Yes, a two-lens wide-angle kit makes sense, if you either have a 24-120 or 24-105 for general use and want a better wide-angle kit, which would match your 14-24 f2.8 or 11-24 f2.8, or if you just want a better lens for shooting indoors handheld and narrower angles than the 14-24 or 11-24 options from Canon and Nikon. Zach, I think this lens is best thought of as a prime lens substitute and not a general purpose zoom. Works great, for example, when shooting events with two cameras, where the other body can rotate between a fast 50, 85, and 70-200 zoom. Also, I feel there is a more significant difference in field of view between a 35mm and a 24mm than the mere 11mm of focal length would lead you to expect. 24mm is often considered the gateway to super wide angle photography because it’s the first focal length that gives real drama in foreground to background perspective. The fact that you so missed your 35mm prime after trading it for a 24mm should underscore the potential value of having both focal lengths in a single, fast, prime-quality optic. This is not a lens for everyone, but it is unique at what it does. I have the Samyang 35mm F1.4 manual focus lens and this Sigma 24-35 F2. The Sigma lens has a beautiful image quality (IQ) at F2 the Samyang doesn’t get near, indeed can’t even lick its boots. The Sigma 24-35 F2 has the breathed on very nice IQ that one normally associates with Leitz and Zeiss glass. Yes the Sigma is a heavy beast. 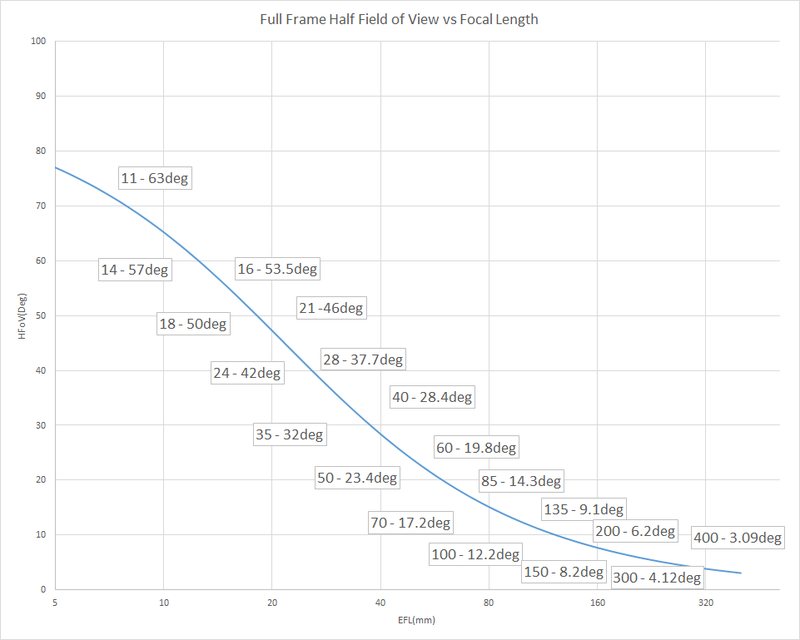 The relationship between FoV and focal length is not linear. The formal equation is Image Height = f*tan(theta) where theta is in radians. If you solve this at a series of focal lengths for IH=21.64, you get the 1/2 FoV for any focal length. 11mm difference at 100mm would be 11%. 24mm vs 35mm is a substantial change in view, comparable to 100mm to 145mm. STILL, it is a relatively small change compared to what we are used to (e.g. 24 vs 70mm). I envision this being very useful to someone shooting an event with two cameras. e.g. 24-35 and 70-200. I love the IQ and feel of newer Sigma lenses. Thanks for the review! since when primes do have faster AF then zooms? I’m yet to see a prime faster focusing then a zoom. This statement is absolutely wrong. Thanks for the review. Part of me knows that I would love this lens in a dual camera setup for weddings and another part of me knows that a 24-70 is just as heavy and would suit just fine. I don’t need or like giant 70-200s. Perhaps Sigma will release a longer companion f2 lens. But how good is it at 29.5mm? That’s the focal range I’m most interested in. Petzval (field curvature) and vignetting contribute more or less equally to “swirly bokeh.” The cats eye shape to the specular highlights is mostly to do with vignetting, while the reduced size of the specular highlights is caused by Petzval. When you have astigmatism, you pinch the defocused specular highlights; they either become narrowed in the sagittal plane, strengthening the cats-eye, or they become narrowed in the tangential plane, rounding the bokeh out. Unless I am much mistaken, swirly bokeh is mostly caused by onion shaped highlights. These are caused by light falloff, not astigmatism. Thanks for the review and I’m sure it’s a sharp lens but when you say the build quality is unsurpassed and the attention to detail is incredible, does this mean anything? What about it’s build is unsurpassed and what details did Sigma address that are incredible? And then a “85-135 f2.0 would make a lot of sense”? Never been on trail (street) and rounded a corner to see a waterfall (building) you can’t fit in frame, huh? What, “24mm and 35mm offer very limited differences in focal length”? You have not noticed that the angles of view are very (and I mena VERY) different? 24-50 f/2 would have been a gam-changer. 24-35 is more of a great technical accomplishment that won’t change the world that much. Kudos to Sigma for going after this, though. If I was going to pick a ~1.5x f2.0 zoom, a 85-135 f2.0 would make a lot of sense. (or an APS-C equivalent) Otherwise it seems just too restrictive.